Place dough in the fridge for about 30 minutes so that the dough firms up. Roll dough into small balls (about 1 inch round). Roll the balls in powdered sugar and place on a ungreased cookie sheet. Remove cookies onto a cooling rack to cool....if you don't eat the warm cookies first! Makes about 1½ to 2 dozen, depending on the size of your cookies. What’s better than a cookie that satisfies your chocolate cravings, requires only a few simple ingredients (I mean, with a cake mix as a cookie base, the tough part is all done for you!) and tastes delicious? Not much, I tell you. Not much. 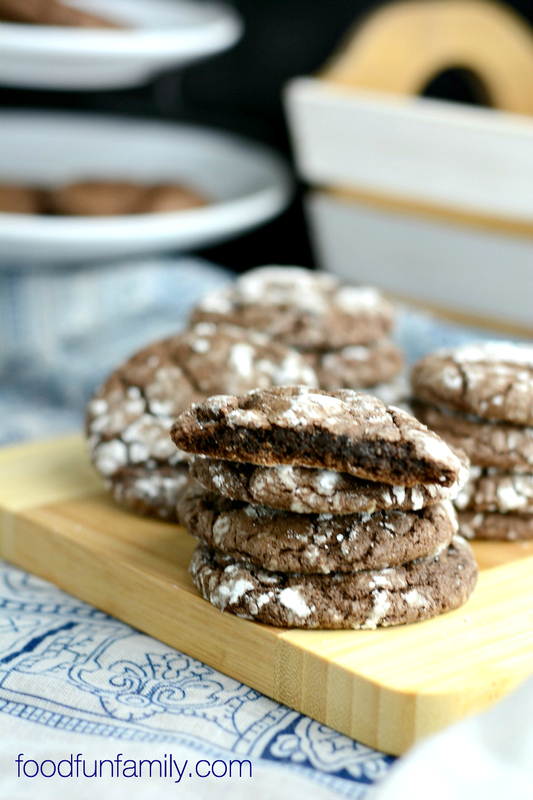 Oh, I like this recipe for Chocolate Crinkle cookies. They are easy to make and look so pretty. I want to make these for a snack for my son and daughter! These cookies are right up my alley! Thanks for linking up with What’s Cookin’ Wednesday! Thank YOU! And really, what could be better than an easy dessert that tastes delicious?! I’ve always wanted to make these cookies. These will be really easy using a cake mix. I had no idea you can make crinkle cookies with a box mix, and I like that it uses oil, not butter. I must try these! these look delicious! thanks so much for sharing at #merrymonday ! ooh Yum I love a soft cookie! Thanks for the recipe! Thanks for linking up to Merry Monday! Yummed & Sharing on Fb! Have a great week!